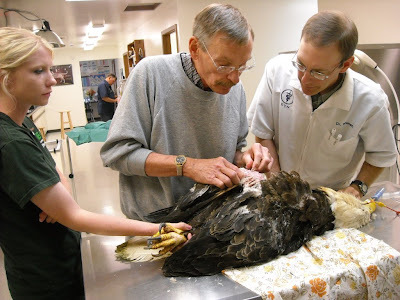 ( Photos: Adult Bald Eagle underwent successful surgery this morning for complcations following being shot in the wing and suffering serious injury to it. 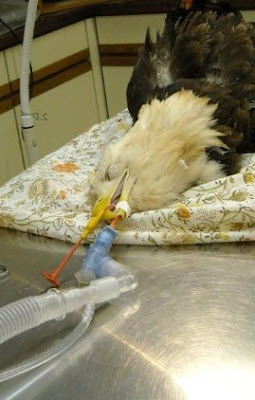 I never get used to seeing a magnificent Bald Eagle in a vulnerable position. Yet, that is how I too often see them in my work. 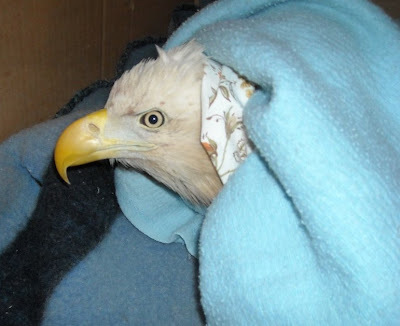 The bald eagle that had surgery this morning was a beautiful adult from Sault Saint Marie, MI. He has been shot in the left wing, but it was weeks before he was weak enough to be captured. The wing was mostly healed from the initial injury and had serious infection. We tried a relatively simple approach to wrapping the wing, but it was not successful. Today he had surgery meant to save his life, but he will never fly again. As sad as that is, he is a bird that seems comfortable with captivity and can be a foster dad or help in the education of OUR species at a permitted facility. The surgery itself was done at the Antigo Veterinary Clinic under the expert care of our veterinarians Dr. Dennis Bardelmeier and Dr Dan Turunen. Post surgical care is done at REGI. He was kept wrapped and on a warming blanket for the first several hours after surgery. He continues to recover well and has even ate a hardy dinner tonight. We continue to try to get the grass mowed and weeds cut. It rained again today so that was a challenge. There are tours tomorrow so we hoped to finish more than we did. Tomorrow I am helping Troy Walters of Trees For Tomorrow train his new education owl. 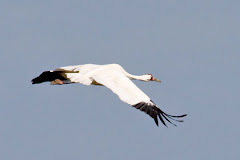 It is important to help new educators learn the ropes so their birds an be great ambassadors for wildlife. Education is so important to the field of wildlife.